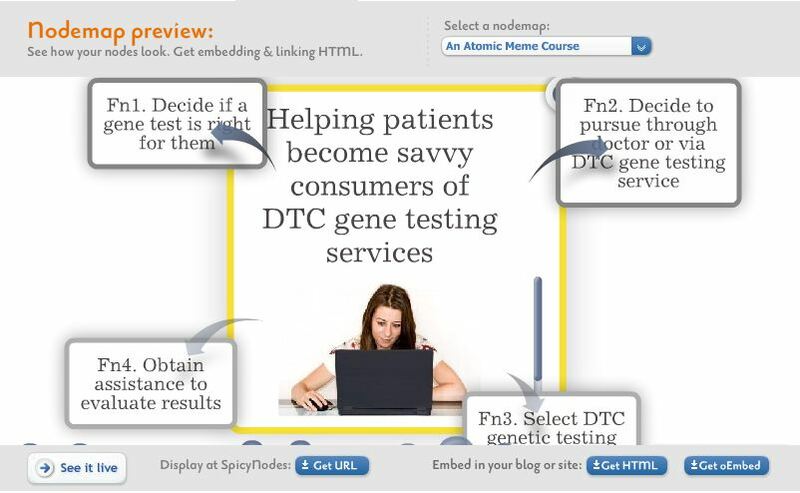 Spicynodes is a mindmapping tool that’s versatile and easy to use. Spicynodes allows you to organize information and ideas in a mindmap “tree” where each branch of an idea or node can be used as a springboard for additional branches or subnodes. You can register with Spicynodes or use your Google, Yahoo or OpenId account to take advantage of the many free features of the Spicynodes platform. I’ll show how I used Spicynodes to create a quick course outline. Use “Edit details” to provide a few details about your Spicynodes (you can always edit these later). You can make your Spicynodes private or share it with the world. 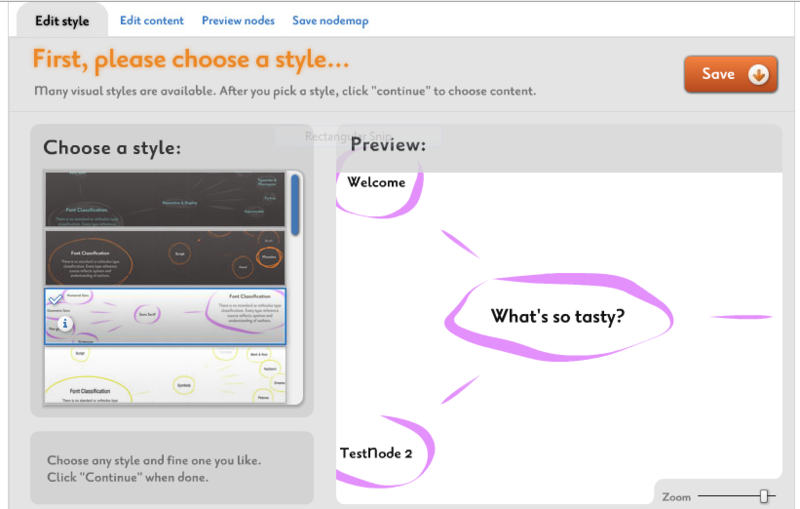 Select a style for your Spicynodes map. 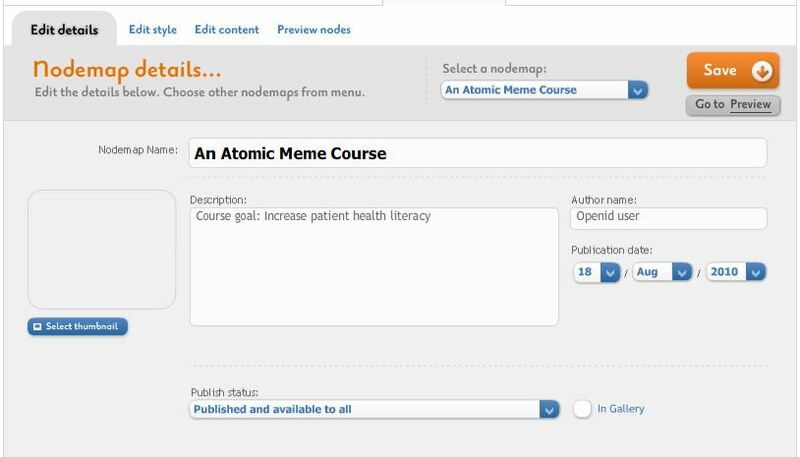 Next, edit the content of the basic Spicynodes nodemap (a map starting from a central node that branches to three additional nodes). Since I’m creating a course outline, I started with the course goal as the central node. A particularly nice feature of Spicynodes is the ability to illustrate nodes with multimedia. You can describe a node using text, links to other sites, images, and you can even embed video content. I edited the existing branching nodes to reflect the functions my learners will need to be able to perform to achieve the course goal. These can form the core of my course objectives. It’s easy to add additional nodes and subnodes by simply clicking on the “plus” icon. In the illustration below, I’ve added subnodes to reflect the knowledge learners will need to be able to perform the functions I’ve identified. When you’re done, you can see how your Spicynodes will look live. The illustration below focuses on the subnodes created around function 1. You can view the entire Spicynodes I created for this course prototype by clicking here. 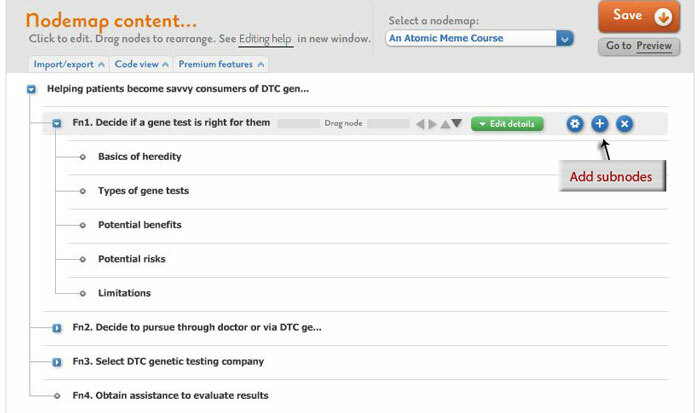 As demonstrated above, Spicynodes is a great instructional design tool. In addition to creating a basic course outline, you can also use it to outline the actual design elements of a course, collecting ideas, fonts, images, and videos, using it to create a radial storyboard (a shout out here to David Anderson who presented an excellent talk at the ASTD Southwest Learning Summit describing the use of mindmaps as part of a storyboarding process). You can get your learners hooked on using mindmaps with Spicynodes. There’s essentially no learning curve required and it’s a great way to encourage learners to brainstorm and organize their thoughts and resources at the same time. Because of the radial nature of Spicynodes, it’s also an interesting storytelling tool. For example, you can use it to create flash fiction, using each node to tell a story from a different point of view. Because you can embed Spicynodes into your Website and add links at various nodes and subnodes, a different use of Spicynodes is to create navigation elements. Many other uses for Spicynodes are described at the Spicynodes site and you can view the Gallery for examples of some of the creative Spicynodes that others have made and shared. This entry was posted in Spicynodes and tagged ASTD, brainstorming, elearning, instructional design, mind map, mindmapping, mindmaps, spicynodes, storyboarding, storyboards. Bookmark the permalink.